ARLINGTON, VA, April 10, 2019 – A new partnership between Supply Wisdom, the industry leading continuous risk monitoring solution, and NormShield, the only provider of standards-based cyber risk assessment and mitigation tools, will provide global enterprises with comprehensive risk coverage to eliminate the need for subscriptions with multiple risk intelligence vendors. Since 2010, global enterprises have used Supply Wisdom for continuous third-party risk intelligence, real-time risk monitoring, in-depth risk assessments, and health scorecards to minimize the risks of disruption facing their business and third parties including real-time alerts of negative news and cyber breaches. 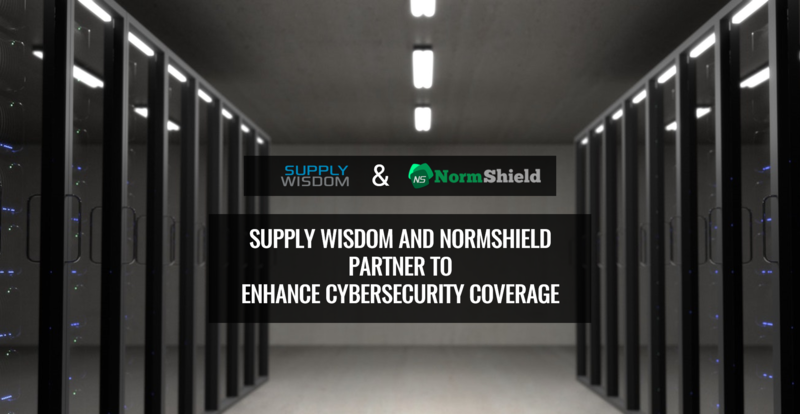 Partnering with NormShield equips Supply Wisdom with expanded coverage of cyber to include cyber attack susceptibility. Third party risk is no longer the exclusive domain of business continuity, risk management, vendor, and governance. Chief Information Officer (CIO) and Chief Information Security Officer (CISO) offices play a significant role in managing and monitoring third party risk arising from data security, privacy, and compliance issues. The partnership between Supply Wisdom and NormShield recognizes this shift and equips CIOs and CISOs with real-time risk alerts as well as comprehensive Cyber Risk Scorecards of their third parties, while continuing coverage of other third-party risks: financial, client, people, governance, regulatory, compliance, solutions maturity and security. Supply Wisdom was born in 2010, out of a need for an early warning service to help enterprises detect and prevent disruptions. Today, Supply Wisdom equips global enterprises with continuous third-party risk intelligence, real-time risk monitoring, in-depth risk assessments, and health scorecards to minimize the risks of disruption facing their business and third parties. Supply Wisdom is a NeoGroup company. More information at www.supplywisdom.com. NormShield enables enterprises to monitor their external cyber risk posture and perform nonintrusive cyber risk assessments of their suppliers, subsidiaries and target acquisitions. Using easy-to-understand scorecards, including our 60-second Rapid Cyber Risk Scorecard, we provide standards-based letter grades on various risk categories, along with data on how to mitigate each risk in priority order.